Simon Hynd is a director on the rise. This Edinburgh-based graduate of Napier University, and winner of a Scottish BAFTA (for Short Film in 2004) for Tumshie McFadgen’s Bid For Ultimate Bliss, is now a veteran television and commercials director, with one feature to his name: Senseless, a horror film adapted from the book of the same name by cult author Stona Fitch, and starring former Roswell High pin-up, Jason Behr. Simon has most recently directed the last three episodes of the well-received BBC4 show, Bob Servant Independent, starring Scottish acting legend, Brian Cox. Simon took time out of his busy schedule to swat away some pesky geekzine questions. Andy Jamieson: How did the Bob Servant Independent project begin, and at what point did you become involved? Simon Hynd: Bob Servant began life as a pseudonym which writer Neil Forsyth used to reply to spam emails. He would start these long, protracted, and very funny email correspondences with spammers, the results of which were published as a novel. Bob’s character was developed through these exchanges and then further fleshed out in a fictional autobiography. The emails were serialised on radio, for which Brian Cox voiced Bob. From there Neil and producer Owen Bell began developing a TV comedy based around the character. BBC4 commissioned a pilot, which then grew into a 3 episode commission when Brian Cox agreed to play Bob. Annie Griffith directed the first 3. Off the back of them, BBC4 commissioned a further 3, which is just as well because Neil and Owen had devised it as a 6 part series with a story arc across the 6. I was asked to direct the final 3 episodes. AJ: How was the experience of working with veteran screen icon, Brian Cox? SH: He’s an incredibly serious, dedicated actor. One of my favourite aspects of my job is being able to help develop and watch great actors bring scenes to life before my eyes, it’s like being invited to a really intimate stage play where these brilliant performers work their magic just for you. Brian has a bit of a reputation for being cantankerous, but what I witnessed was a man who is incredibly focussed on the job at hand and doesn’t like too many distractions. AJ: What’s next for you – more television work, or will you focus now on film work? And which do you prefer to work in? SH: I’m lining up work in both TV and film at the moment. The British film industry is a fickle and frustrating beast where a lot of people spend a lot of time developing projects which never get made. It’s also incredibly difficult to make a living from the British film industry – particularly as a writer or director, so I’m grateful to have the TV work. TV is more like a regular job to me, less stressful and offering a regular wage. Films offer more opportunity to explore my ‘voice’ as a film-maker, but TV allows me to get more on the floor experience directing. I’d love to do more films if the conditions are right – but they rarely are. 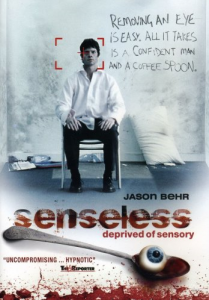 AJ: Senseless was your feature film debut as director. How was that as an experience? SH: It was the most fraught, stressful, but exciting experience I’ve had in my life. I wrote the script very quickly and got the funding very quickly – it was a bit of a too good to be true scenario. The film is very dark in its themes and tones and this was reflected in my experience making it. In post-production we got caught in the cross-fire between two companies who had gone into litigation against each other and the post process ground to a halt for over a year while they sorted that out. Meanwhile I was on hold, being told I’d get back into the edit suit every week, so I was unable to take any other work. When we finally got the film finished the massive hiatus had had an impact on the film’s distribution so it wasn’t as widely seen as it could have been. Having said that, it has a bit of a cult following, with audiences either really appreciating it or hating it passionately! AJ: Do you have a stockpile of projects-to-do or do you work more instinctively? SH: I’ve usually got a couple of feature ideas on the go at any time. As time passes one or two might fall away to be replaced by new ones. I’ve got two which I’m excited about at the moment. One I’ve been working on for about 9 years, the other was an idea that formed very quickly before Xmas and I wrote an outline for. It’s currently being considered by a decent film production company. AJ: What is your background as a director? SH: Made horror films with my friends as teenagers. Became a bit of a film obsessive in my early 20s but didn’t think a normal kid from a small village could ever be a film director. At this point I hadn’t done a degree but I was doing a lot of photography in my spare time. I found the course at Napier in Edinburgh that combines photography and film-making and applied. The course allowed me to learn more about directing and to have a crack at it. I made a few shorts that were pretty well received (you can see my first student short Virus at www.simonhynd.com). Upon graduation I wrote a short comedy which got selected for the Tartan Shorts scheme. That led to more shorts, commercials, Senseless and then into TV. AJ: What films and/or directors do you consider to be influential or inspirational to you? SH: There was the period in my late teens/early twenties when it seemed a huge amount of fantastic cinema was being made – basically from Reservoir Dogs in ’92 to Out Of Sight in ’99. 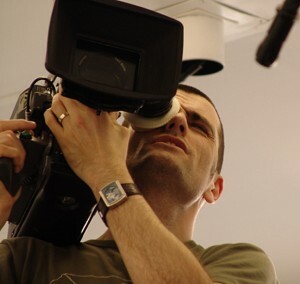 Particular films and directors that inspired me during this time include the obvious ones: Fincher for Se7en and Fight Club, Besson for Leon, Soderbergh for the way his stuff is edited, Wong Kar Wai/Chris Doyle for cinematography, Shane Meadows for proving that local kids could make feature films. From there I got into world cinema and classic cinema, Kurosawa, Wilder, Bergman, Polanski etc. AJ: Favourite films? Tv shows? SH: For a long while my stock answer to favourite film was Chungking Express. I was living in Hong Kong in 1994 when it was made and when I first saw it shortly after it summed up a very special time in my life. There was something about its vibrancy, its unique visual aesthetic and its freshness that meant I fell head over heels in love with it. It was also one of the first films I saw where the director’s fingerprints were very clearly all over it so it was kind of easy for a beginner like me to pick apart and study. Having said all that, I sat down and watched it for the first time in probably 12/13 years recently and it didn’t move me in the same way. TV shows would be all the usual stuff, Curb, Walking Dead, Breaking Bad etc. Some less well known shows I’m into include, Community and Louis, which I love. The first series of Hunderby was a gem. AJ: Best advice you’ve been given? SH: Best advice my dad ever gave me was you can either have a full beard or no beard – no in betweens. Can’t think of any great film advice I’ve been given. What I would say to aspiring directors is, be brave, it’s the work that’s different that gets noticed. But here’s the rub, you have to be unique, while still being able to appeal to as large an audience as possible. When I was a student I worked for the Edinburgh Film Festival every summer. As part of my job I got to see hundreds of shorts. I realised how many of them are very similar and it made me more conscious of finding a distinctive voice. This is half to do with director’s style, but also half to do with the sort of stories you tell so it all has to begin with a distinctive script. If you can write an original story that has the ability to speak to a wide audience then you’re well on your way to directing your first film. Thank you to Simon for his time. 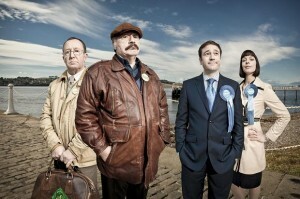 The final episode of Bob Servant Independent is on Wednesday 27th February at 10pm on BBC4. Local Talent, Media, Q & A, T.V.